Bhubneshwar: India clinched one gold through Sudha Singh in women's 3000m steeplechase event and four other medals to maintain their numero uno position on the third and penultimate day at the 22nd Asian Athletics Championships on Saturday. 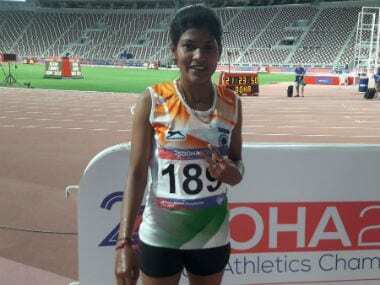 The 31-year-old Sudha won her race in 9 minute 59.47 seconds to grab the lone gold for India to steal the limelight in front of a packed crowd at the Kalinga Stadium. 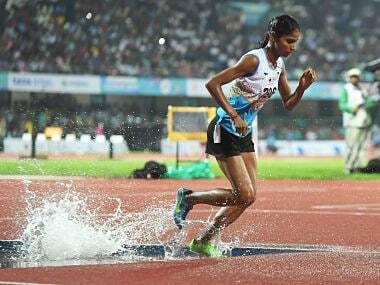 It was Sudha's first gold in her fourth attempt in the Asian Championship. Anu Raghavan added a silver in the women's 400m hurdles, while woman triple jumper NV Sheena, men's 400m hurdler Jabir MP and the women's 4x100m relay team grabbed a bronze as India took one gold, one silver and three bronze on Saturday. With one day left in the championship, India remained on top of the medal tally with 7 gold, 4 silver and 9 bronze. China are second spot with 5 gold, 6 silver and 4 bronze while Iran are on third with 4 gold and 1 bronze. The Uttar Pradesh athlete led from the very beginning, and after running together for a while along with the other five competitors, broke away around the halfway mark and left all her rivals way behind to win the gold. She took a lap of honour after her win which also ensured her a berth in next month's World Championship in London. It was a creditable sub-10 minute win for Sudha who has been away from training for several months after she suffered from swine flu on her return from the Rio Olympics last year. North Korea's 18-year-old Hyo Gyong was a distant second in 10:13.94 while Japan's Nana Sato took the bronze in 10:18.11. "I am very happy to win this gold. This is my top level competition after Rio Olympics. I was down with swine flu after the Rio Olympics and I was down for five-six months and after that I started training slowly and steadily. So, this win is special. It is a slow timing but the conditions are not that good," she said after her win. "My coach told me not to hang around for long. He told me to break away from the rest and not wait for the final moment. That was what I did," she added. Raghavan then gave India the second medal of the day with a fine show in the women's 400m hurdles as she clocked 57.22 seconds, behind favourite Nguyen Thi (56.14) of Vietnam. Home crowd favourite Dutee Chand grabbed her second bronze of the championships as she encored the host 4x100m relay team to third place event in 44.57 seconds. The other members of the quartet were Srabani Nanda, Himashree Roy and Merlin K Joseph. Kazakhstan took the gold in 43.53 seconds while China won the silver in 44.50secs. In women's long jump, Sheena was lucky as she grabbed the bronze with her final effort of 13.42m. Jabir then added an unexpected bronze in men's 400m hurdles, clocking a personal best of 50.22 seconds behind Eric Shawn Cray (49.57) of Philippines and Chen Chieh (49.75) of Chinese Taipei. However, in men's 3000m steeplechase, Naveen Kumar, a bronze medallist in 2014 Asian Games, and Durga Das Budha finished a disappointing seventh and eighth in 9:02.95 and 9:04.05 respectively. In men's 110m hurdles, India's Siddharth Thingalaya finished fifth in 13.72 seconds. Kuwait won both the gold and silver with Abdulazia Al-Mandeel and Yaqoub Al-Youha clocking 13.50 and 13.59 respectively.